Microplastics have been found in multiple studies to transport persistent organic pollutants (POPs) into organisms (in particular, polyethylene/polyester). [ix],[x] A past study by Connell, R. et al (1988) also found a positive correlation between polychlorinated biphenyls (a POP) and plastic ingestion (although the plastic studied was not microscopic). [xi] The potential for microplastics to transport POPs into the food chain adds an entire category to potential impacts of microplastics as POPs have a wide array of impacts on organisms. If microplastics significantly raise the rate of POP accumulation in organisms naturally, the presence of microplastics would have complex impacts that may be quite severe. A study by Frias, J. et al. (2010) found mostly fibrous microplastic in samples of the Portuguese coast that was contaminated with POPs (including polycyclic aromatic hydrocarbon, polychlorinated biphenyls, and DDTs). [xii] Sand also provides another pathway for pollutants and a study by Brown et al. 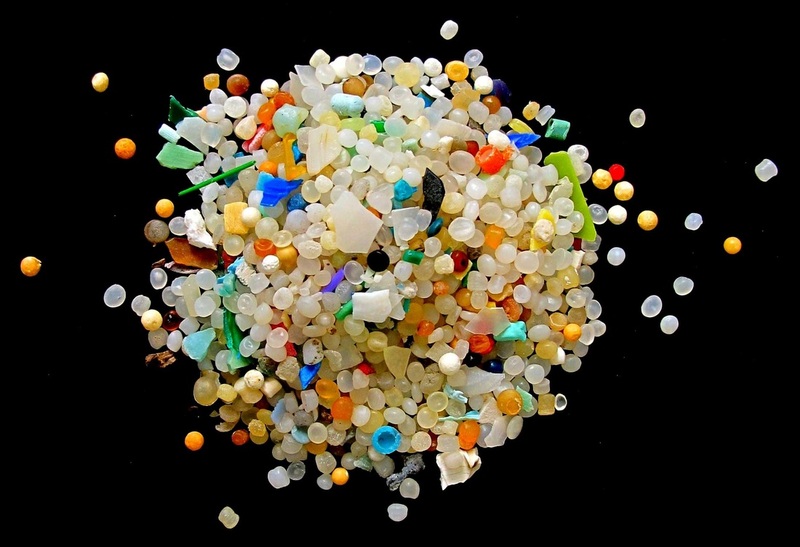 (2013) found that the amount of additives transferred by microplastic (PVC) was not significantly greater than sand. [xiii] This indicates that the pollutant transfer impacts of microplastic may be variable depending on environment. ﻿[i] Kaposi, K. L., Mos, B., Kelaher, B. P., & Dworjanyn, S. A. (2014). Ingestion of microplastic has limited impact on a marine larva. Environmental Science & Technology, 48(3), 1638-1645. [ii] Browne, M. A., A. Dissanayake, T.S. Galloway, D.M. Lowe, R.C. Thompson (2008). Ingested microscopic plastic translocates to the circulatory system of the mussel, Mytilus edulis(L.) Environmental Science and Technology, 42(13), pp. 5026-5031. [iii] Farrell, P., & Nelson, K. (2013). Trophic level transfer of microplastic: Mytilus edulis (L.) to Carcinus maenas (L.). Environmental Pollution, 177, 1-3. [iv] Setälä, O., Fleming-Lehtinen, V., & Lehtiniemi, M. (2014). Ingestion and transfer of microplastics in the planktonic food web. Environmental pollution, 185, 77-83. [v] Lusher, A. L., Hernandez-Milian, G., O'Brien, J., Berrow, S., O'Connor, I., & Officer, R. (2015). Microplastic and macroplastic ingestion by a deep diving, oceanic cetacean: The True's beaked whale Mesoplodon mirus. Environmental Pollution, 199, 185-191. [vi] Lusher, A. L., McHugh, M., & Thompson, R. C. (2013). 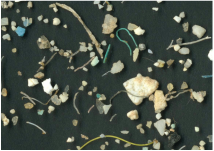 Occurrence of microplastics in the gastrointestinal tract of pelagic and demersal fish from the English Channel. Marine pollution bulletin, 67(1), 94-99. [vii] Murray, F., & Cowie, P. R. (2011). Plastic contamination in the decapod crustacean Nephrops norvegicus (Linnaeus, 1758). Marine Pollution Bulletin,62(6), 1207-1217. [viii] Browne, M. A., Niven, S. J., Galloway, T. S., Rowland, S. J., & Thompson, R. C. (2013). Microplastic moves pollutants and additives to worms, reducing functions linked to health and biodiversity. Current Biology, 23(23), 2388-2392. [ix] Bakir, A., Rowland, S. J., & Thompson, R. C. (2012). Competitive sorption of persistent organic pollutants onto microplastics in the marine environment. Marine pollution bulletin, 64(12), 2782-2789. [x] Teuten, E. L., Saquing, J. M., Knappe, D. R., Barlaz, M. A., Jonsson, S., Björn, A., ... & Takada, H. (2009). 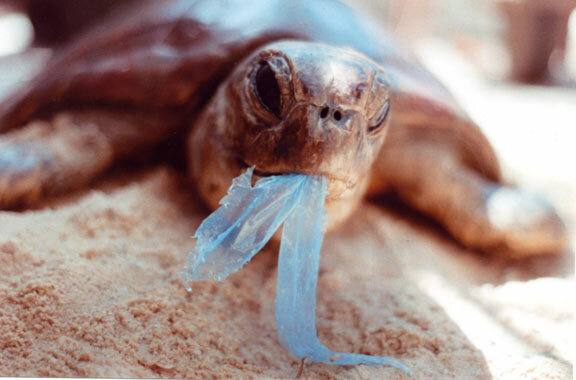 Transport and release of chemicals from plastics to the environment and to wildlife. Philosophical Transactions of the Royal Society B: Biological Sciences, 364(1526), 2027-2045. [xi] Ryan, P. G., Connell, A. D., & Gardner, B. D. (1988). Plastic ingestion and PCBs in seabirds: is there a relationship?. Marine Pollution Bulletin, 19(4), 174-176. [xii] Frias, J. P. G. L., Sobral, P., & Ferreira, A. M. (2010). Organic pollutants in microplastics from two beaches of the Portuguese coast. Marine Pollution Bulletin, 60(11), 1988-1992. [xiii] Browne, M. A., Niven, S. J., Galloway, T. S., Rowland, S. J., & Thompson, R. C. (2013). Microplastic moves pollutants and additives to worms, reducing functions linked to health and biodiversity. Current Biology, 23(23), 2388-2392.